In this particular case, we' re going to be looking at the heraldry in the rose window in the Memorial Chapel at the University of Glasgow. As you can see (and you should be able to click on the picture to see a larger version with more detail), it's an impressive window, with an equally impressive display of heraldry in it. The artist who created the window was Douglas Strachan (1875-1950), and the window was donated to the University by Sir Donald MacAlister (1854-1934), a former Chancellor of the institution. The four coats of arms contained in the window all relate to the founding of the University. I will discuss the arms, and then show how they all relate to that founding. 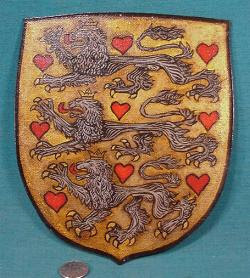 In the center is the achievement of arms of the King of Scotland, James II (1430-1460), a shield of the "tressured lion" with its unicorn supporters bearing banners of the Royal Arms and the Scottish saltire, and the Royal crest atop the crown on the helm, and the Royal mottoes ("Nemo me impune lacessit", or as we might put it down here in Texas, "Don't mess with Scotland", and "In defens", an abbreviated form of "In my defence God me defend"). 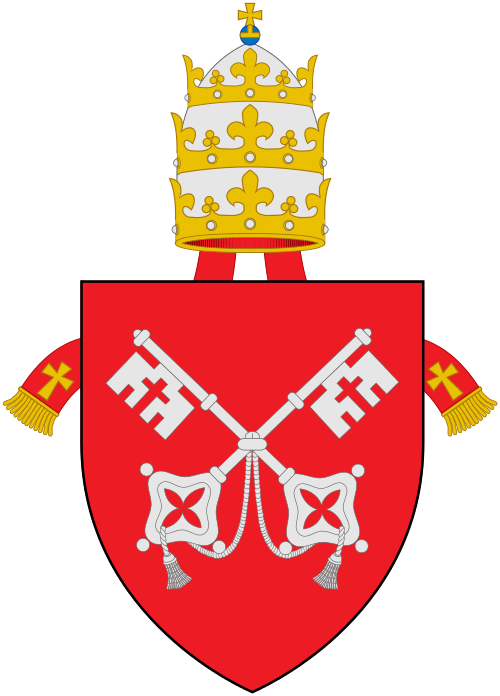 On the left is the arms of Pope Nicholas V (not to be confused with the Anti-Pope Nicholas V), Tomaso Parentucelli (1397-1455). As a quibble, I do not find the arms as emblazoned in the window here (Argent two bendlets wavy the upper gules and the lower azure) among the arms of the Popes. The arms that I have seen for Nicholas V everywhere else are blazoned as Gules two keys crossed in saltire argent. On the right, we have the arms of Bishop William Turnbull (ca.1400-1454), Bishop of Glasgow and first Chancellor of the University, Argent three bull's heads cabossed sable armed or. Bishop Turnbull was an ally and counselor to King James II, and served as his Keeper of the Privy Seal from ca.1440-1448. Prompted by Turnbull, James II wrote to Pope Nicholas V to request the establishment of a university in Glasgow. The Pope responded with a Papal Bull, a letter or proclamation named for the leaden seal (or bull) which was attached to it. 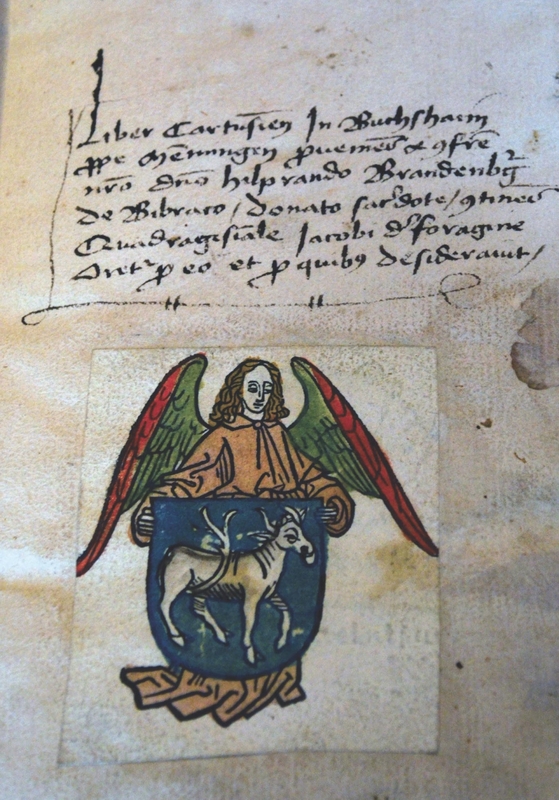 Issued on 7 January 1451, the Bull erected a new studium generale for the teaching of "theology, canon and civil law, as well as the arts and any other lawful faculty". 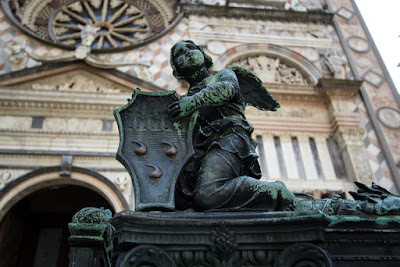 He granted the new University's doctors, masters, readers and students all the privileges, honours and immunities enjoyed by their counterparts at the University of Bologna. Turnbull became the University's first Chancellor. So there you have it! The arms of the University of Glasgow, King James II, Pope Nicholas V, and Bishop William Turnbull, all neatly (and in this window, beautifully) connected together with the founding of the University of Glasgow in the 15th Century. Just because it looks heraldic, and just because it's used a lot like a coat of arms, doesn't necessarily mean that it is really heraldry. 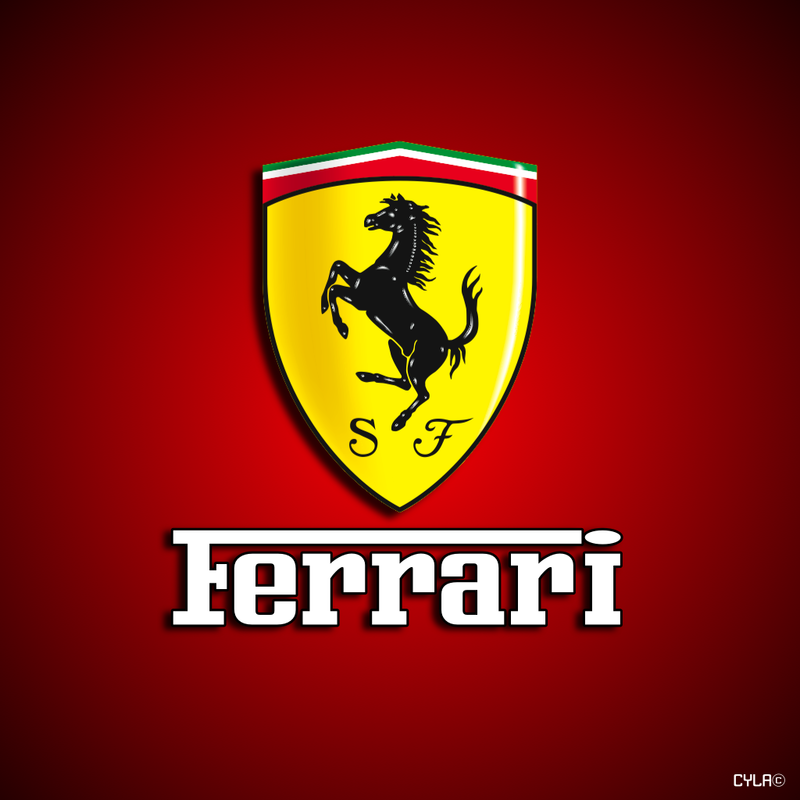 A case in point is the logo of the Liverpool (England) Football* Club. 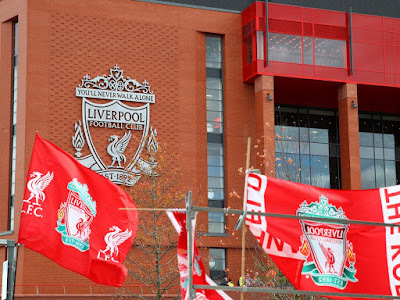 In an article in The Independent about the LFC's upcoming 125 year anniversary, the Club has announced that their uniforms next season "will feature a special commemorative crest" to mark this milestone. Leaving aside the misnomer of calling it a "crest," the article goes on to talk a little bit about the current logo and the changes that have been made to it over the years. It all began (relatively) innocently enough, with a shield with the Liverpool liverbird on it, and the name of the LFC in chief (and, presumably, the "motto" scroll with "Est. 1892" to keep that date in front of everyone). Since then, in 1992 to mark the centenary of the Club a representation of the Shankly Gates (erected at Anfield stadium in 1982 as a tribute to former manager Bill Shankly) was added (serving rather like a crest would in real heraldry. And yes, the words appear on the gate in that position), and later the two "eternal flames" were placed on either side of the shield (as supporters?). 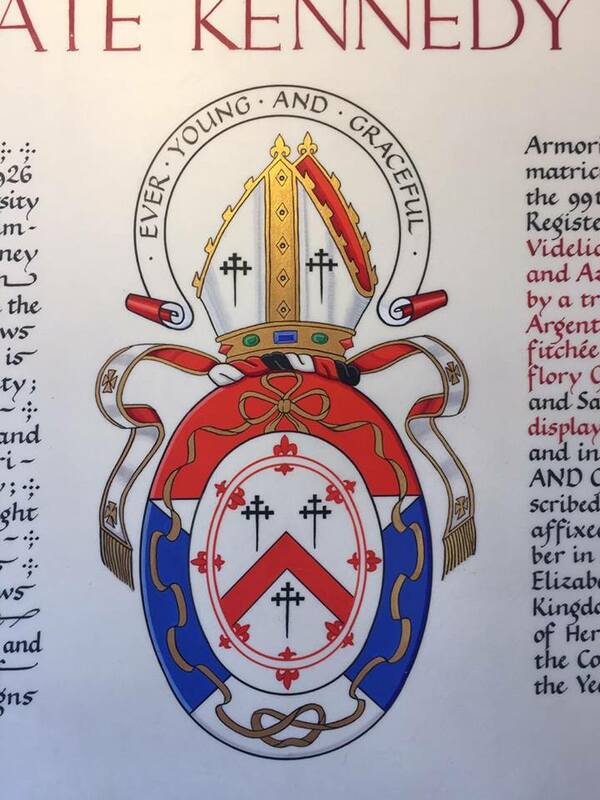 So, what began as a comparatively simple quasi-heraldic design has been added to in recent years to make the whole thing more complex and therefore less readily identifiable, and now they're saying that they're going to do something else to it. 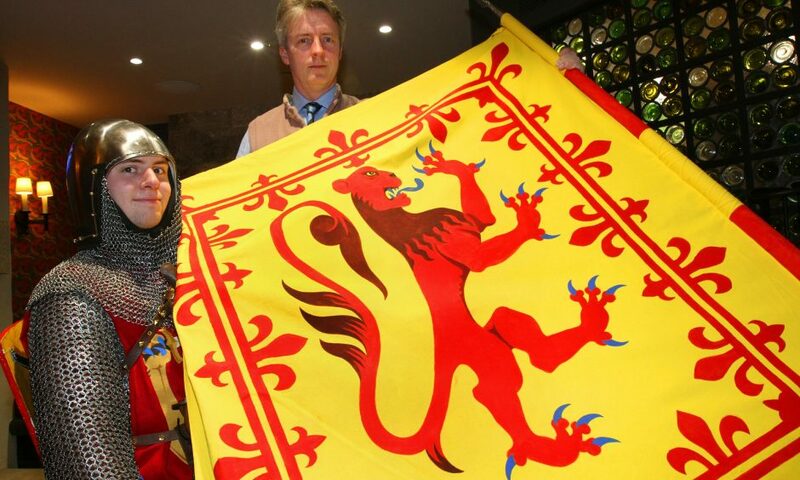 Fortunately for the LFC, they are based in England rather than Scotland, where (in Scotland) mucking about this way with designs on shields is supposed to be done in coordination with the heraldic authority there. 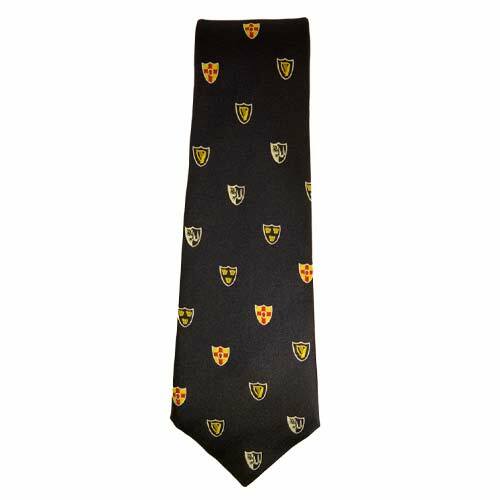 The College of Arms may frown on this sort of thing, but it has no enforcement authority. * By "football" I mean, of course, what most of the world considers to be football, but which we in the United States persist in calling "soccer" so as not to confuse it with what the rest of the world calls "American football" (or other, somewhat less polite, names. See the images below for a taste of what I mean). I regularly go out and take a look at the daily offerings on a number of "daily tee shirt" websites. Most of the time, it's okay. It's not often that a site will have an offering that appeals to my particular interests, and so mostly it's strictly for the entertainment value. Because some of the tee shirt designs offered are pretty interesting. For example, one that appeared recently showed the bridge crew of the starship USS Enterprise watching the opening crawl of Star Wars Episode 4: A New Hope on the main viewscreen. Which I thought was a pleasantly amusing crossover piece. 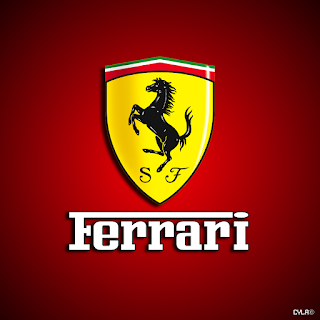 As you can quickly see, it's a "Godfather" take-off of the well-known Ferrari logo (below). It's also quasi-armorial, which is one reason why I had to buy it. Another reason I felt I had to buy this one is that a few years back, in 2008, while attending the International Congress of Genealogical and Heraldic Sciences in Quebec, Canada, I found a tee shirt that was also a play on the Ferrari logo, only with a rampant moose on the shield, and the word "Quebec" beneath (in the same typeface as the others here. This shirt will be a great companion to that one. So you can understand that I had to buy the Corleone shirt when I saw it. Because, heraldry. I had a great time Thursday night (March 16) talking about doing genealogical research in New England to the Williamson County (Texas) Genealogy Society! There were even some transplanted New Englanders there. One of them asked me a couple of questions before the meeting, trying to sound out whether or not I knew what I was going to be talking about. You'll be happy to know that I passed! And I talked with a couple of sisters afterwards whose relative, it turns out, had performed the marriage of my great-great-grandparents. It really is a small world! 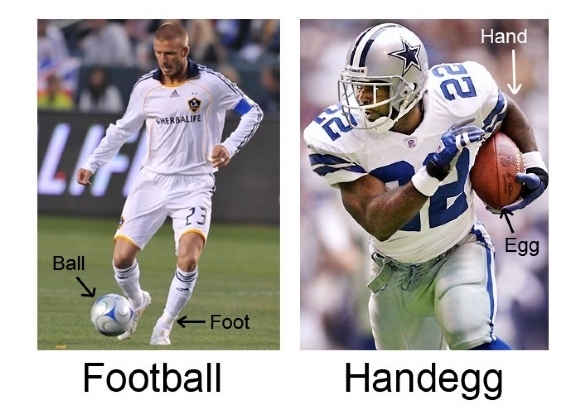 Oh, yeah, this is a blog about heraldry. Well, in honor of St. Patrick's Day the next day, that night I wore the tie that I purchased in Dublin, Ireland, which is strewn with the arms of the four provinces of Ireland (Ulster, Munster, Leinster, and Connaught). "Patrick's Day?" said Mr. Dooley. "Patrick's Day? It seems to me I've heard th' name befure. Oh, ye mane th' day th' low Irish that hasn't anny votes cillybrates th' birth iv their naytional saint, who was a Fr-frinchman." So, anyway, I had a great time with the many members of the Williamson County Genealogy Society, and look forward to the opportunity to visit them again. One of the questions we often get as heralds is what a particular shape or charge means. Generally, the real answer is, "We don't know." Other times, however, we do know, and it can be more than one thing. 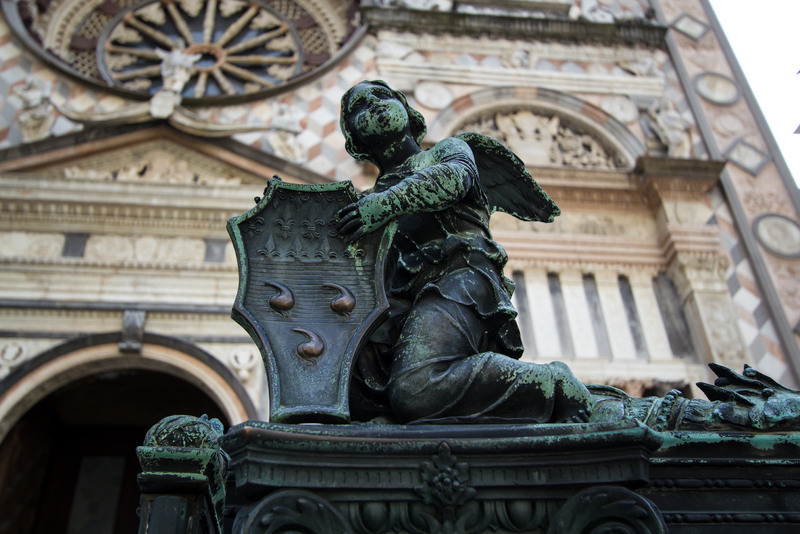 A recent (February 16, 2017) article posted on Atlas Obscura discusses the fact that, "In Heraldry, Hearts Can Symbolize Everything From Lily Pads to Testicles." No, really! 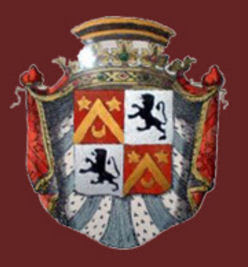 Eric Grundhauser, the author, uses for his primary examples the "hearts" on the arms of Denmark, and the "inverted hearts" on the arms of the Italian Colleoni family. Denmark's hearts, above, strewn across the field behind the three lions, are thought to actually represent lily pads, "søblade" ("seeblatter" in German), or "sea leaves." 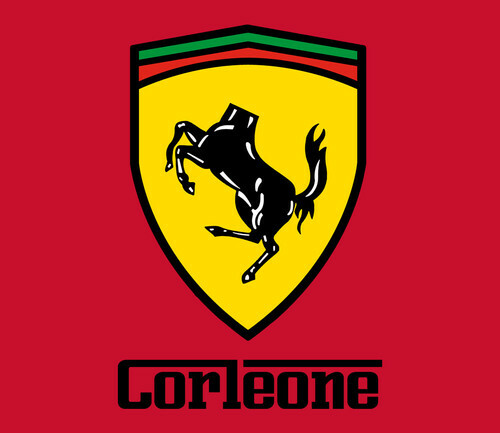 For the Italian family of Colleoni, however, the "inverted hearts" on their shield represent testicles, "coglioni" in Italian, thus making these canting arms (a coat of arms which is a pun on the surname). My take on this? Though "sometimes a cigar is just a cigar," sometimes a heart is not just a heart. Three Boar's Heads on a Coat of Arms. Again It Is Asked: "Why?" 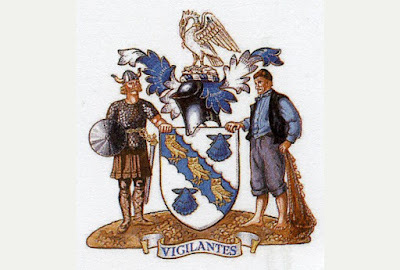 Like the arms of Cleethorpes in the last post, in another article from the Grimsby Telegraph we have a discussion about the coat of arms of Grimsby, Argent a chevron between three boar's heads couped close sable armed or langued gules. The arms were recorded in the heralds visitations of Lincolnshire in 1592 and 1694, which places them on a pretty solid footing. They were exemplified by the College of Arms in 1975. * A commenter to the newspaper supposes that "the boars represent the fact that many local dignitaries and politicians are like pigs with their noses in the trough." According to the article, however: "It is believed that the boars' heads allude to a right of the Mayor and Alderman to hunt boar in Bradley Woods." However, it also notes that, "Several families connected with Grimsby had similar charges on their arms." This last, I expect - based on how many other civic arms in England incorporate charges from prominent local families - may be closer to the truth. Anyway, in a recent (March 4, 2017) article entitled "Kate Kennedy Club awarded its own coat of arms" in The Courier, they published the following photograph with the caption: "Maxwell Cutting and David Fox Pitt display the new coat of arms." 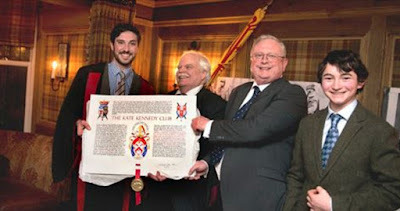 The arms being displayed in the photo are, of course, not the newly-granted arms of the Kate Kennedy Club at all, but clearly and obviously to anyone with a smattering of knowledge of Scots heraldry, a banner of the Royal Arms of Scotland. As you can easily see, the granted arms cannot possible be confused with the Royal Arms. But someone at the newspaper managed to do it anyway. Three Owls on a Coat of Arms. The Question Is Asked, "Why?" 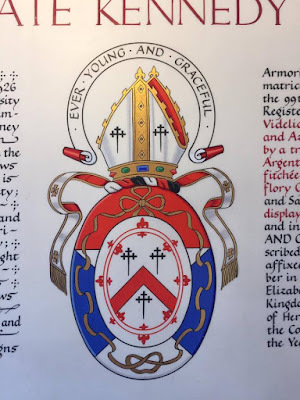 It's always interesting to run across an article (whether on the internet or in a newspaper or magazine) that discusses a coat of arms, and the background of and reasons for the particular charges. There is, of course, a lot more discussed about the arms than just the owls. Indeed, there's a 19th Century photograph of Levi Stephenson, who is thought to be the model for the sinister supporter of the arms. Check out the photograph in the article and you can certainly see the resemblance! Things got switched up, heraldically as well as otherwise, when the Cleethorpes District Council was created in 1974. And you get to see how the local football (soccer, for my American compatriots) club uses a modified version of the old arms as their logo. * The answer: Not, as one commenter opined, because owls, like the public, are kept in the dark. 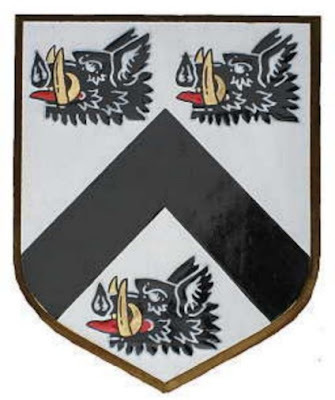 In fact, "The owls are thought to represent the three villages of Oole, Itterby and Thrunscoe, which make up the Thorpes of Clee." I very recently ran across an item entitled "The First Known Printed Bookplate," and wouldn't you know it? 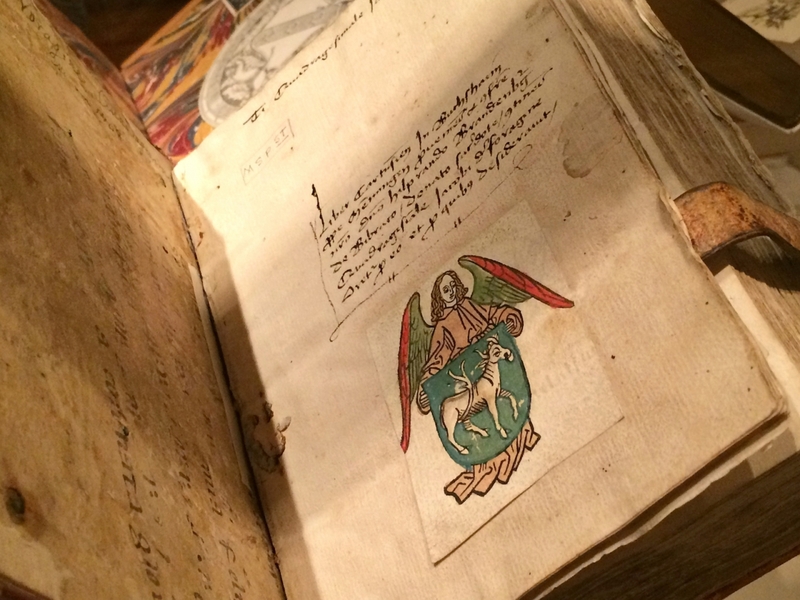 The oldest bookplate is armorial! It's a woodcut print dated to 1480, and the owner was the scholarly priest Hilprand Brandenburg of Biberach. He placed these hand-colored, printed bookplates in over 450 books he donated to the Carthusian monastery in Buxheim (near Memmingen), Germany. The one pictured above (and below) appears in Jacobus de Voragine's Sermones quadragesimales (Bopfingen, Württemberg, 1408). 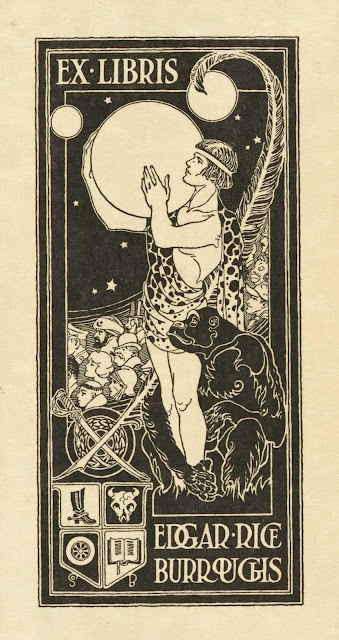 Bookplates have a long and hallowed use for identifying the owners of books. (Indeed, I have and use several different designs of armorial bookplates myself.) 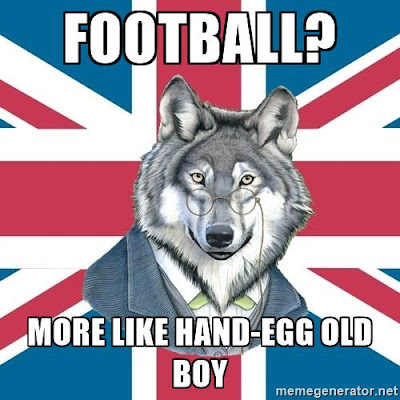 And they have over the centuries taken on a number of different forms. 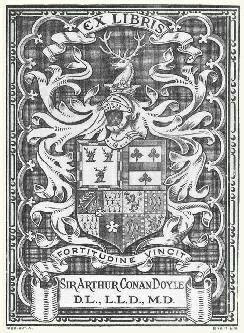 See, for example, these (also armorial) bookplates for authors Sir Arthur Conan Doyle and Edgar Rice Burroughs. But how interesting is it that the oldest known printed bookplate also happens to contain heraldry?